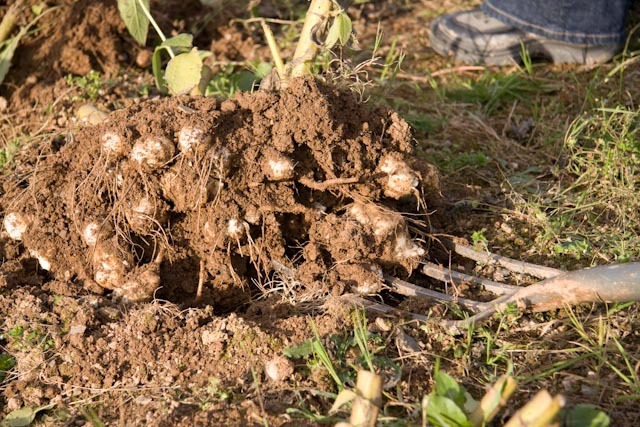 Our parsnips and Jerusalem artichokes are harvested mechanically in the winter which is a problem with our heavy soil: the crop comes up encased in great clods of earth and even the toughest tractor can get bogged down. To ameliorate this, we rent some land near Exeter which has a much lighter, sandy soil, allowing more reliable access. It also helps reduce fanging in the parsnips (when the root forks into two) although most of this is caused by nematode damage to the root tip. This week we brought in the last of the crop and early results are looking mixed at best. The parsnips were planted during a particularly dry spell (the soil playing against us on this occasion) and as a result were slow to establish and put on bulk, resulting in many undersized specimens. They subsequently suffered a carrot fly attack, and the damage caused allowed canker to get hold. All told, not so good. They are going through the grading process as I write and it will be a couple of weeks before we have an accurate picture of how we’ve done. On the plus side, the Jerusalem artichokes look really good and are probably going to provide a heavier yield than expected, so the two crops should balance each other out – always assuming we can persuade you to accept a few more artichokes. It is a sorry fact that parsnips are generally preferred to the humble artichoke. Closer to home we are making steady progress through the purple sprouting broccoli: Rudolph, our earliest variety, is now finished and the Red Spear is nearly done too. Next on the horizon is Red Head which we will start on for the first time this week. I will be covering ground preparation and tools and kit needed. As the weather has suddenly turned arctic and the ground is pretty frozen in many parts of the country there is really not a lot one can do in these conditions. No one in their right mind would willingly stomp forth into their garden brandishing fork in one hand and bag of manure under the other arm. I really feel for the field workers out there picking leeks and kale etc. Come rain or shine they just get on with the job. So I am going to introduce composting into the arena too. This is a massive subject so-introduction- I mean. Now is the time to choose a site in your garden, if you haven’t one already. I am a great fan of pinching some of your lawn, redesigning your garden so that you can have a go at growing. Lawns are great, yes, but take a lot of care and are not half as rewarding as producing flowers, veg and herbs for your table, in my opinion. A decent amount of sun and light are needed to grow successfully. Good well drained ground is a bonus but you can do a lot to improve your soil and its make up by adding well rotted manure and your own compost made from veg and fruit peelings and waste from your garden. Weather permitting, now is a good time to get out there and dig out perennial weeds such as docks, dandelions, couch grass, buttercups and the like. Spread some well rotted manure and any rotted compost from your own compost heaps and lightly dig in. Covering the ground with plastic sheeting or even cardboard will warm the ground slightly and stop weeds from germinating. 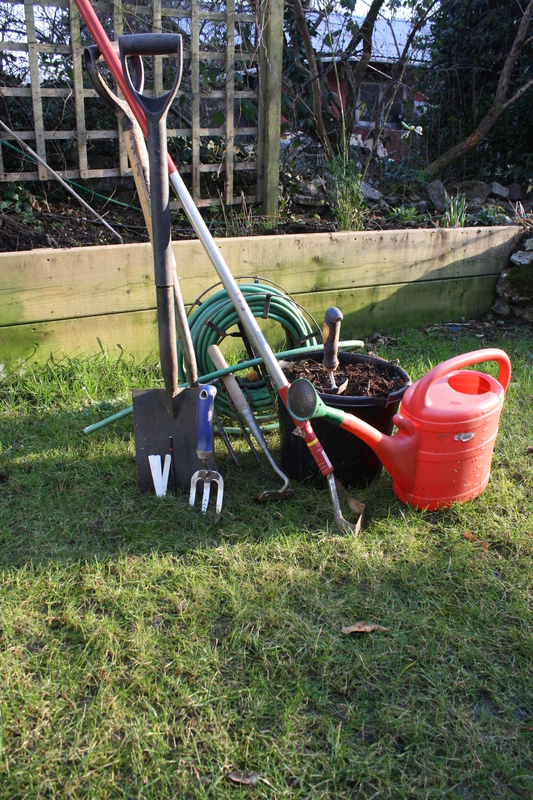 Fork, spade, hand trowel, hoe, watering can with rose, hose and bucket, plant labels and pencil, fleece, well rotted manure. To make compost you need to build up a good mix of nitrogen rich waste from your garden such as grass clippings, annual weeds and carbon rich materials such as newspaper, cardboard and bark. The smaller the material is chopped up or shredded, the faster it will decompose. Fruit and veg peelings from your kitchen may be added but no cooked foods or proteins should be used as these attract vermin. Clippings from pruning can also be added but nothing too woody. Ash from fire places and woodstoves can also be added too. Turn the heap regularly as air is an important factor to encourage decomposition. Be careful not to add huge amounts o lawn clippings at once as you will end up with layers of slime. garden, building your own heaps out of wood (old pallets are ideal) is the way to go. 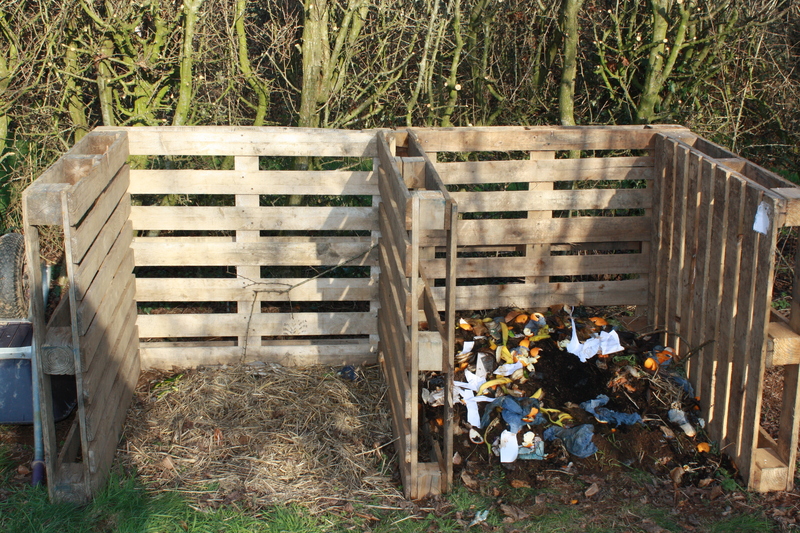 Having two compost heaps side by side is best, as you can fill one up and leave to rot and then start building the second one. Avoid putting in perennial weeds, especially bindweed, couch grass and ground elder. Also avoid adding diseased materials and weed seed heads. These should be put in the dustbin. Make sure to add layers of different materials and water if looks too dry. Cover with old carpet or plastic. The level of the contents will drop as it rots. This process happens faster in the summer when it is warmer. It really depends on how you keep your heap as to the speed of decomposition. Over the spring/summer period you can produce good compost within four to six months. It’s a slower process over the autumn winter months. When ready add to your garden and lightly dig in. This will improve the make up of the soil and adding nutrients and fertility. I will look at propagating from seed and suggesting some easy varieties to try.